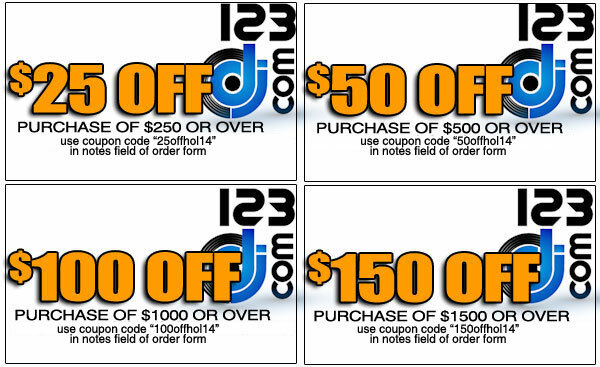 Chicago DJ Equipment Online Superstore - PRO DJ & STUDIO EQUIPMENT & ACCESSORIES AT THE LOWEST PRICES! Excludes Trussing and Freight Shipped (oversized) items. Not valid with other promotions, discounts or special prices. Does not apply to open box, warehouse resealed or demo units. Not valid if total price violates manufacturer MAP pricing. Pioneer, American Audio and other brands may not apply. Some items may not apply. Due to manufacturer restrictions on advertised pricing, please add coupons in the notes section of the shopping cart, and amount will be deducted manually during processing. 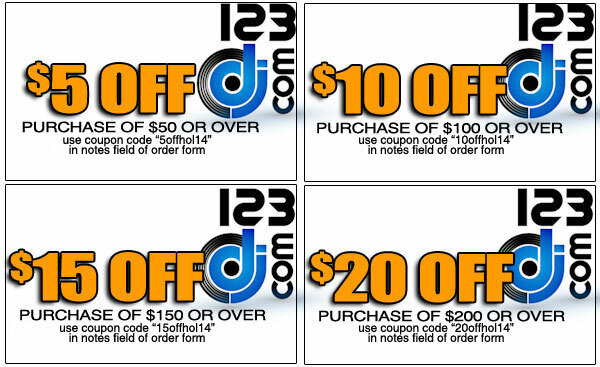 You may also print these out and bring them into our store and use them at point of sale.